In December 2013, an event in London claimed to honour `Women in Mining.’ It did quite the opposite. WoMin brings together women in mining communities from across the African Continent. 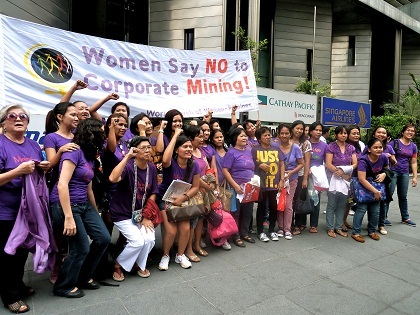 WoMin joined with others in the International Women and Mining Network to protest the event and its logic. Here’s the statement we distributed in London. WoMin, an Africa-wide regional platform of well over three dozen organisations representing peasant women or working with women directly impacted by the extractives industries, stands with sister organisations in other parts of the world in our campaign against this Women in Mining ‘women-washing’ project that conceals the devastating impacts of mining on many millions of poor women across the Global South and North. This project paints an appealing veneer over the realities by pointing to the benefits and successes enjoyed by an infinitesimally small number – one hundred – of women the world over. In sub-Saharan Africa women produce 60-80% of food consumed in rural households and so when lands are grabbed and polluted by the mining industries it is the women who pay first. When waterways and underground supplies are polluted by toxic chemicals and community members fall ill, it is women that must carry the burden of searching for safe water and caring for the ill. When families are divided through the system of migrancy that is integral to the mining industries in Southern Africa especially, it is women from the labour sending areas that must reproduce families with little or no support, care for husbands returning ill from the mines, and are themselves left deeply vulnerable to contracting HIV/Aids and other sexually transmitted diseases. For these and many more reasons, we say NO to this devastating model of mining the WIM project is seeking to reinforce through its project. We advocate and struggle for an alternative ‘model’ which protects food rights, which internalises all social and environmental costs to corporations, which operates at a smaller and less destructive scale, which privileges the developmental interests of local communities and regional interests over and above the national and international interests of corporations and the political elites aligned to them, which restores a different relationship between humanity and eco-systems and which supports the reproductive and healing labours of peasant and indigenous women. This is our vision and our call on the occasion of the WIM project launch which only serves to legitimate an industry which stands opposed to the interests and aspirations of the majority of the world’s women. WoMin is housed in the International Alliance on Natural Resources in Africa (IANRA), a regional alliance of organisations working with communities to advance a just mining regime.